Track and log emails sent from your inbox with the HubSpot Sales Chrome extension. Please note: if you've enabled General Data Protection Regulation (GDPR) functionality in your account, your legal team is the best resource to determine how your company uses email logging and tracking. You can also customize your extension settings to disable this functionality for a specific message or for specific contacts or email domains. Any existing contacts who have not granted a lawful basis for data processing will be tracked anonymously. Tracked email: tracking an email gives you insight into how the recipient interacts with the email. You'll be notified when the contact opens the email via a pop-up notification on your desktop. Paid Sales Hub users will be notified when the recipient clicks a link in the email as well. This information will also be stored in your HubSpot Sales Chrome extension in the upper right corner of your Chrome browser, and in your HubSpot activity feed. 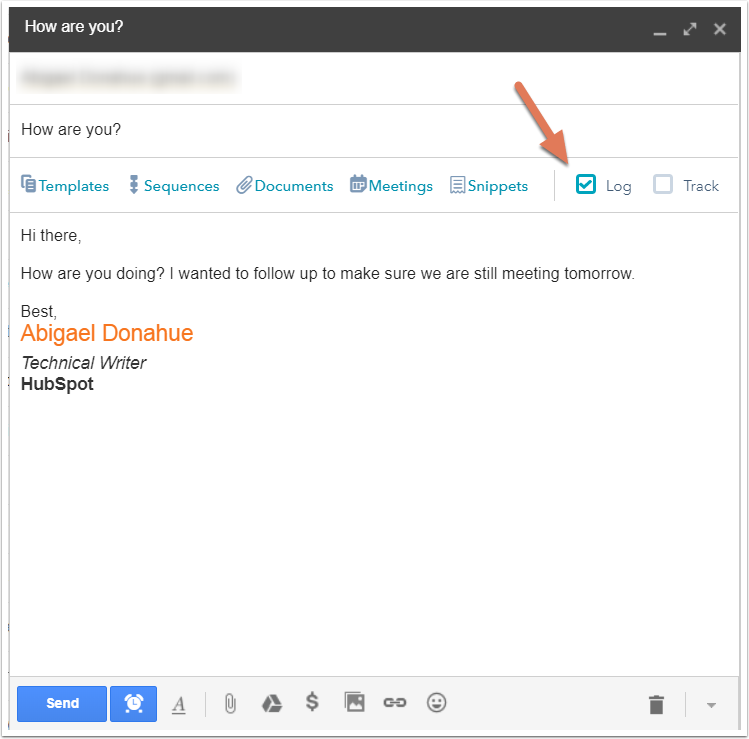 Logged email: a logged email is recorded on the recipient's contact timeline in HubSpot. You can keep a record of your email communication with a prospect in HubSpot to help you understand where they are in the sales process. You can also use this history of logged emails to keep track of past relations and make sure you're communicating regularly with your most promising leads. Logged emails do not give you insight into open or click information. You can send an email that is both tracked and logged. That way, you'll receive open notifications as well as having a record of the email communication in HubSpot. You can also set defaults for tracked and logged emails. Compose a new email. Enter the email recipient, the subject line, and the email body. 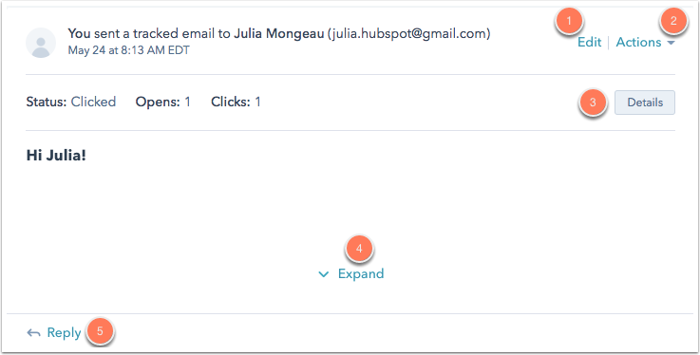 Before your contact opens the email, the email subject line and recipient will show in your activity feed in HubSpot as Sent. You can also see how your contacts are engaging with your tracked emails from the Chrome extension. To access your activity feed from the Chrome extension, click the HubSpot sprocket icon sprocket in the upper-right corner of your Chrome browser. Once the recipient opens the email, you'll receive a real-time, pop-up notification on your desktop. When you navigate back to your activity feed or Chrome extension feed, you'll see the email information marked as Open. Click the Show all activities dropdown menu below the contact's name to see when the recipient opened your email and where they were located. You will also see a history of the contact's activities listed in the dropdown menu. Learn more about how email tracking and sales notifications work. You can specify email addresses and domains that you never want to log emails for in your HubSpot account settings. Or you can add these email addresses and domains in your Chrome extension settings. Please note: emails larger than 15 MB will not log to your HubSpot account. Attachments count towards this limit. Your email will still be delivered successfully to the contact, but you will not see the email logged to their record. If the recipient's email address is not already associated with a contact in your account, logging an email will automatically create a new contact in HubSpot. Email that are logged to HubSpot using the extension will automatically be associated to the recipient's contact record, its associated company record, and the five most recent open deal records associated to the contact. In your HubSpot account, navigate to your contacts, companies or deals. Edit: add or remove the email from any associated company or deal records. The company record and the deal records must be associated with the contact to add them here. Actions: choose to delete or reply to this email. Details: click to see specific information about the email send. Expand: click to see the full body of the email. If there's an ongoing email conversation, click View thread to see all of the emails in the thread. Reply: click Reply to send an email reply to the contact from HubSpot. Please note: to send email replies from HubSpot and log incoming replies to HubSpot, you must have a connected inbox.